Computational genomics is a field where many diverse academic groups collaborate, each bringing to a project their own distinct academic cultures. In particular, each academic discipline involved in computational genomics has its own publication strategy in terms of the types of papers they publish and how they package methods and results in these papers. Publishing papers is extremely important to careers in academia and science, because all scientists are reviewed for tenure or promotion based on our publications records. An important factor in our review (unfortunately) is the impact factor of the journals that we publish in. Here, we describe our lab’s publication strategy and the reasoning behind it. Our lab is a computational lab, and the main contribution of our lab to Bioinformatics is the development of methods for solving important biological problems, particularly in the area of genetics. These new methods are implemented in software packages that (hopefully) are used by others to enable biological discovery. Naturally, the key papers our group produces are papers that describe and explain potential applications of these new methods. Roughly speaking, there are two strategies for publishing methods in our field. The first is to focus on writing methods papers that are primarily dedicated to describing the computational advances. The second is to focus on publishing our novel methods as part of more comprehensive papers that present a biological contribution. In this case, our method is primarily described in the supplementary materials. Over the span of my career, I have seen computational researchers receive more pressure to follow the second strategy in order to have papers published in a high impact journal. Unfortunately, following the second strategy often delays publication (sometimes for years), because peer review often involves applying the method to a new dataset and/or performing extensive functional validation. Our group primarily follows the first strategy. In addition, we work with other groups and, as collaborators, publish papers focused on biological contributions. This strategy works out well for us, and we feel that writing methods-focused papers is the best way for us to make a contribution to science. We hope that other computational biology groups will follow our example and publish more methods papers. Doing Justice to our Work. We can fully explain the methods only in papers dedicated to methodology. Since our contribution is methods, the best way to push the science forward is to clearly describe our method and the context of its development and application. In a dedicated paper, we are most likely to have enough space to fully describe the method and explain how the approach works. Methods papers also have the space (and are typically required) to compare the proposed method with previous methods. This comparison puts the performance of the paper in perspective to the work of others. Methods papers ideally provide enough details that other groups can build upon our method and compare their results to our published results. Sharing authorship on these papers also allows students who were involved in the development of these methods to demonstrate their strong technical skills. In my view, computational biologists should be evaluated by the quality and impact of their methodology development and departments when making hiring decisions should consider this impact. The impact can be measured by the number of users of the software implementing the methods, the number of citations of the papers describing the methods and the discoveries that these methods have enabled. These factors are more important than the impact factor of the journals where the methods are published. Self Determination of Publishing. There are no outside bottlenecks preventing us from finishing our papers quickly, and we can control the publication process of our papers. A methods paper is primarily written by members within our lab, and authors evaluate the method using both simulated and established datasets. This structure means we need not wait for outside collaborators or experiments to finish. Finishing the paper faster means that have more time to work on new papers. Increased Number and Improved Quality of Collaborations. 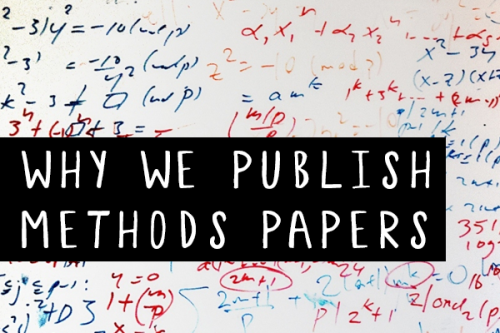 The methods paper is a widely-distributed, often freely available, finished product, and many prospective collaborators approach us after reading a paper from our group. More importantly, in our collaborations, we have very little competition over authorship. Students in the group are happy to work hard on a project just to be in the middle of the collaborative paper, because they already are first author on their own methods papers. Our methods development students are not competing for credit with the students in the collaborators group. Project Longevity. Writing a methods paper forces the method to be finished, evaluated, and documented, and publishing the paper forces us to release the software. This process encourages the project to have more longevity. Once the method is fully developed, new students can easily pick up and build upon the previous method. Once a student leaves the lab, the method can persist with new lab members as it is stable, well-documented, and de-bugged. Long after they have left the lab, many of the students who wrote methods papers in our group continue to author papers related to applications of their method. In full disclosure, we do identify one negative aspect of the methods paper publishing strategy. High impact papers require collaborations, and it is less likely that methods developers can publish high impact journals as a senior or corresponding authors. While it is less likely to occur, members of our lab do occasionally gain senior authorship in high impact journals through collaboration. We have found that the combination of methods papers, where you are the senior or first author, and high impact papers, where you have middle authorship and it is clear that your role was the application of the method, is overall a positive outcome and looks good in your publication record. For example, Eran Halperin and I published a 2004 paper in the lower-impact journal Bioinformatics that described the HAP haplotype phasing method. The HAP method was later used in a Perlegen-led paper that was published, with Halperin and I as co-authors, in the notably high-impact journal Science. The 2005 Science paper helped me get my job at UCLA; it was clear what my contribution was as I also authored the methods paper in Bioinformatics. Our lab has produced several other examples of methods papers paired with high-impact collaborations. Kang et al. (2008) presents the EMMA method in Genetics (impact factor of 5.963), and a collaboration with the Jake Lusis group on the HMDP presents results in Genome Research (impact factor of 11.351) (Bennett et al. 2010). More recently, we published the CAVIAR method (Hormoziari et al., 2014) in Genetics and collaborated with Dan Geschwind’s group in applying the method to a Nature paper (Won et al. 2016). In: Genome Res, 20 (2), pp. 281-90, 2010, ISSN: 1549-5469. In: Science, 307 (5712), pp. 1072-9, 2005, ISSN: 1095-9203. Individual differences in DNA sequence are the genetic basis of human variability. We have characterized whole-genome patterns of common human DNA variation by genotyping 1,586,383 single-nucleotide polymorphisms (SNPs) in 71 Americans of European, African, and Asian ancestry. Our results indicate that these SNPs capture most common genetic variation as a result of linkage disequilibrium, the correlation among common SNP alleles. We observe a strong correlation between extended regions of linkage disequilibrium and functional genomic elements. Our data provide a tool for exploring many questions that remain regarding the causal role of common human DNA variation in complex human traits and for investigating the nature of genetic variation within and between human populations. In: Bioinformatics, 20 (12), pp. 1842-9, 2004, ISSN: 1367-4803.